A basic understanding of teamwork theory can help you develop a high-performing project team. For many companies, when a project starts it will be staffed with a new team. Some of the team members may have worked with each other in previous projects, but as a whole, the team is new. As the project manager for a newly formed team, you will want to help them get to an effective and high-performing state as quickly as possible. Understanding the stages of group development can help you build a cohesive team that gets results. One of the most influential models of teamwork theory was developed in 1965 by Bruce Tuckman. His original model identified four stages that all groups pass through as they move from "newly formed" to "high-performance" teams. In 1977, he revised the model to include a fifth stage. 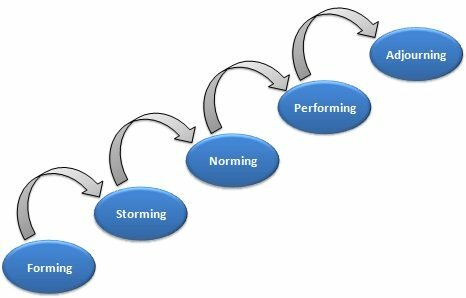 Those stages are Forming, Storming, Norming, Performing, and Adjourning. During the Forming stage, members of the project team meet each other and learn about the tasks they will need to perform. Team members will try to see how they fit in with each other and understand what is expected of them. During this stage, it is critical for the project manager to provide structure and direction for the team. Clearly defining the project's objectives and making sure each team member understands their role and responsibilities will help you lead the team through this stage successfully. The Storming stage is characterized by interpersonal issues such as conflict and polarization. During this stage it is common for team members to challenge each other, including the project manager! Team members will also question what they are doing and how it is being done. 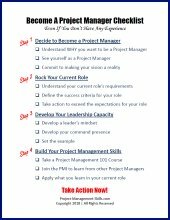 As the project manager, this will likely be the most challenging time leading your project. Understanding that this type of conflict is normal for any team will help you pass through this stage successfully. During this stage, some of the skills that will help you build your team are conflict management, active listening, and relationship building. It is also important for you to be assertive, confident, and positive during this stage, especially if some of the team members are challenging your leadership. As conflicts become less intense and the team members begin to understand and accept each other, the team will gradually move into the Norming stage. It is during this stage that your team starts to come together and is able to focus more effectively on the project tasks and objectives. During this stage, you will want to focus on keeping everyone moving in the right direction. Communication and constructive feedback will help you do this. You can continue your team building efforts by arranging social events with the team and making sure to give positive recognition to team members. In the Performing stage, team members are comfortable with each other and group norms have been accepted. Interpersonal and structural issues have been settled and support task performance. Team synergy is high during this stage which results in high performance. Now that the team is performing at a high level, you will be able to focus more of your energy on leadership activities and less on supervisory activities. This level of synergy amplifies the overall effectiveness of your project. As the project comes to an end, the team moves into the Adjourning stage. At this point, the team has become very close and many of the team members will feel a sense of loss. For this reason, this stage is also known as the Mourning stage. As the project manager, it is important that you arrange for a celebration to recognize the team's accomplishments. This will close the project on a positive note. Plus, you never know when you will work with some of these same people on a future project you are leading. They'll remember the recognition and appreciation you showed them on this project. The Tuckman model is one of the most influential models of teamwork theory. Understanding its five stages of group development can help you develop a high performing project team. Teamwork in the workplace is critical for project success. Learn why teamwork is important and the key steps you can take to create an environment for effective teamwork in organizations and projects. Fun team building games with instructions so you can increase your team's motivation and teamwork. These team building exercises and ideas are perfect in the workplace. Learn how organizational structure types can affect how you manage your project.